Swift Parrots are an endangered species with a total population estimated to number between 2000-2500 birds. They are a migratory species that breeds in eastern Tasmania and crosses Bass Strait to spend the autumn-winter months on the south-east Australian mainland. The Killawarra and Boweya forests at the northern end of the Warby Ranges are both critical sites for this species, and they also occur seasonally throughout other patches of suitable habitat around Glenrowan and Glenrowan West. Their distribution is driven by food availability. They mostly feed on eucalypt nectar from species such as Mugga Ironbark Grey Box and White Box, and they also consume lerps – the sugary coverings of the tiny psyllid insects that occurs on eucalypt foliage. Swift Parrots typically occur in flocks, usually of less than 10 birds but sometimes large aggregations form in areas where food is abundant. 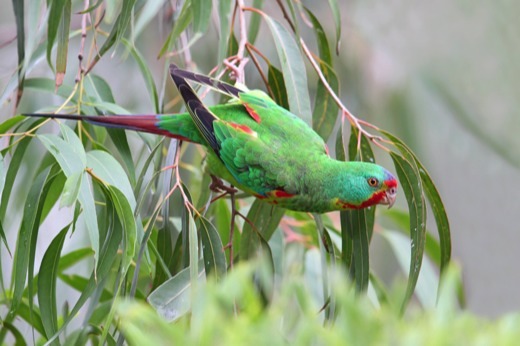 They commonly associate with small honeyeaters and lorikeets but Swift Parrots are normally conspicuous due to their distinctive ‘pip-pip-pip’ calls.